Mrs. Dart and I created a Summer Activities site, so the kids can practice what they learned in school this year over the summer. The kids played the different games on this site in the final computer class. The students will be learning about oceans by doing a variety of online ocean activities. The students will learn about pond life by doing a variety of online Pond activities. The students were free to play anything on the Kindergarten Apps site. I worked one-on-one with them to assess their mouse skills. The students are learning about Patriotism and Symbols in the classroom. They used Pixie to create a Patriotic scene. I loaded stickers of famous US monuments for them to use. The Kindergarten class is learning about recycling in class for Earth Day. So in computer class the kids got to do a number of online activities around recycling. Click here to get to the recycling activities. 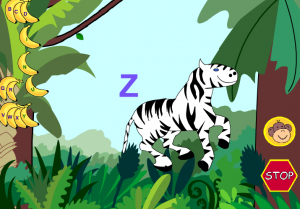 To celebrate Spring, the kids will have fun with some online Spring activities. Friday, March 2 marks the 108th Anniversary of Dr. Seuss' birth. Since 1998, the National Education Association (NEA) has designated March 2 asRead Across America day. 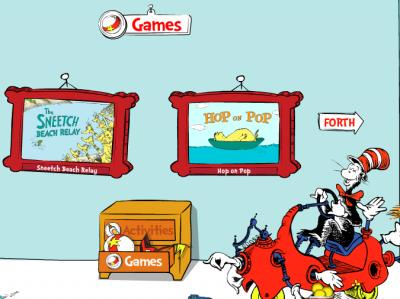 In honor of Dr. Seuss, we will be playing educational games fromt eh Seussville website (click on the picture below).